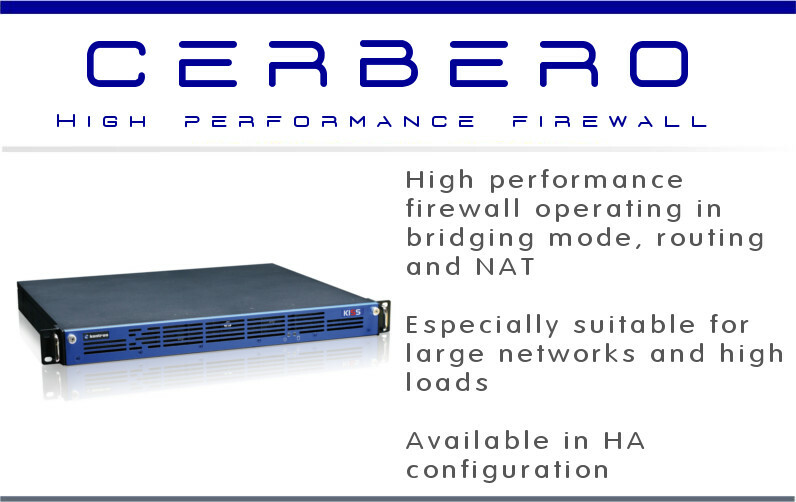 Cerbero is a firewall designed to manage high traffic load without produce latency or slowdown. It can work in bridging mode, NAT/PAT and routing mode, depending on the scenario. The bridging mode allows to filter the traffic without changing the network layout, because in this configuration Cerbero is transparent into the network. Cerbero is made with a server-class hardware, Intel Xeon CPU, 4 GB Ram or more and high throughput network cards. This configuration allows the management of several hundreds of rules without slowing down the network traffic. Cerbero has also two hard disks configured in mirror used to store the output of the selective logging, witch is a valuable tool of analysis of the traffic. The configuration is made through the Web Interface that allows to create groups of services, network and hosts, and use them inside the rules set. The Web interface shows also the system log, the traffic log, the system status and workload. Cerbero is available in High Availability configuration, for automatic configuration syncronization and firewall hot swap.